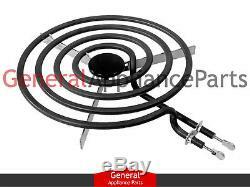 International Jenn-Air Caloric Range Cooktop Stove 8 Surface Burner Y04000035. This 8 burner element has 4 turns/rings and has a Y-Frame structure to support the element. This burner element is rated at 2100 watts. The wire looped terminals have been replaced with these solid terminals. This element also replaces some flat style terminal elements. Whirlpool Estate KitchenAid Roper Maytag Admiral Amana Speed Queen Jenn-Air Magic Chef Crosley Caloric Glenwood Hardwick Menumaster Modern Maid Montgomery Wards Norge JC Penney Wards Sears Kenmore. The surface burner elements, those metal components that get red-hot and generate heat, are the most important parts of any range. When the elements fail to heat properly, it's time to replace them. It's a simple procedure any electric stove owner can easily accomplish in a few minutes' time. You can usually identify a burnt-out element by blistering or small holes on the element's coils. A burner that plugs into a receptacle is easy to test, just unplug the non-heating burner, plug it into another working receptacle, restore the power to the range, and test it. If the burner works, you know its original receptacle is probably faulty. If it doesn't work in the good receptacle, the burner is bad and must be replaced. Do not be alarmed if a new element smokes a little when you first use it. Y04000035 86918 7650900 7406P040-60 7406P026-60 7406P014-60 51582 42129 332-210 332-156 332-146 332-144 31734609 19950007 1938354 1938347 1938342 1938304 1938-354 1938-342 1938-304 14205035 14200318 0E00801999 0E00801699 07650900 07650900 04000035 0310182 0308110 02034-05 0088757 0088354 0086918 0071627. 1058AH-W 1058AH-Z 1058WH-W 1500PAA 1500PAW 1500PRA 1500PRW 15GA-1 15GA-1-94 15GA-1-GG 15GA-10 15GK-10 15GN-1 15GN-1-94 15GN-1-GG 15GN-10 15GY-1 15GY-1-GG 15GY-10 15HA-10 15HA-10-94 15HA-10-GG 15HN-10 15HN-10-94 15HN-10-GG 15HY-10 3500PPA 3500PPW 3500PPW-D 3500SPA 3500SPW 3510KPA 3510KPW 3510KRA 3510KRW 3510PPA 3510PPW 3510PRA 3510PRV 3510PRW 3512WPA 3512WPL 3512WPW 3512WRA 3512WRW 3520SPA 3520SPW 3520SRA 3520SRW 3521WPA 3521WPV 3521WPW 3521WRA 3521WRV 3521WRW 3521XPA 3521XPW 3521XRA 3521XRW 3522WUA-D 3522WUV-D 3522WUW-D 35DA-7 35DN-7 35FA-1 35FA-1W 35FA-1XS-MS 35FA-1XS-ON 35FN-1 35FN-1W 35FN-1XS-ON 35HA-1 35HA-10 35HA-10-02 35HA-10-NJ 35HA-10XS-MS 35HA-10XS-ON 35HA-1XS-ON 35HA-92DX-ON 35HA-92LW 35HA-92LW-94 35HA-92LX-BO 35HA-92LX-ON 35HA-92W 35HA-92W-94 35HA-92X-ON 35HB-92W 35HK-92LX-ON 35HK-92X-ON 35HN-10 35HN-10-NJ 35HN-10XS-MS 35HN-10XS-ON 35HN-1XS-ON 35HN-92DX-ON 35HN-92KW-EV 35HN-92LW 35HN-92LW-94 35HN-92LX-BO 35HN-92LX-ON 35HN-92W 35HN-92W-94 35HN-92W-EV 35HN-92W-FH 35HN-92X-ON 35HN-92XS-MS 35HY-92LW 35HY-92W 35HY-92W-94 35JA-1XS-ON 35JN-1XS-ON 3621WPA 3621WPW 3621XPA 3621XPW 3822KVA-D 3822KVW-D 3822PRA 3822PRW 3841SVA-D 3841SVW-D 3842PRA 3842PRW 38EA-2C 38FA-2C 38FA-2C-94 38FA-2CW 38FA-2CX-94 38FA-2CX-MO 38FA-2CX-MS 38FA-2CX-OC 38FA-2CX-ON 38FA-2CXW 38FA-2CXW-94 38FA-2CXW-ON 38FB-2C 38FB-2CX-MO 38FB-2CX-ON 38FG-2C 38FG-2CX-ON 38FN-2C 38FN-2CX-94 38FN-2CX-MO 38FN-2CX-MS 38FN-2CX-OC 38FN-2CX-ON 38FN-2CXW 38FN-2CXW-94 38FN-2CXW-ON 38FY-2C 38FY-2CX-MO 38FY-2CX-ON 38FY-2CXW 38FY-2CXW-ON 45EA-2W 45EN-2W 45EY-2W 550AH 550HH 550WH 55HA-1W 55HA-3LX 55HN-1W 55HN-3LX 62990131 62990138 6500PRA 6500PRW 6500SRS 651AH 651WH 653AJ-V-CX 653WJ-V-CX 654AH-ELVW 654AH-EVW 654AH-EW 654WH-ELVW 654WH-ELW 654WH-EW 65HA-1 65HN-1 663AH-CV 663WH-CV 90131 90138 933 933.01 A1500PRA A1500PRW A3500PPA A3500PPW A3510PPA A3510PPW A3510PRA A3510PRW A3520SPA A3520SPN A3520SPW A3520SRA A3520SRW A5651XRS AER1110AAH AER1110BAH AER1140AGH AER1150AAH AER1350AMH AER2350AMH ARR3100L ARR3100L ARR3100L ARR3100L ARR3100NL ARR3100NW ARR3100W ARR3100W ARR3100W ARR3100W ARR3400L ARR3400L ARR3400L ARR3400L ARR3400L ARR3400W ARR3400W ARR3400W ARR3400W ARR3400W ARR3601LL ARR3601LL ARR3601LL ARR3601WW ARR3601WW ARR3601WW BNEA3G1 BNEW3G1 C3521XRA C3521XRW CBE22AA0 CBE22AA5 CBE22AAG CBE24AA0 CBE24AA5 CBE24AAG CBE24CB0 CBE24CB5 CBE24CBG CBE26AA0 CBE26AA5 CBE26AAG CBE26DB0 CBE26DB5 CBE26DBG CE1500PAW CE1500PRA CE1500PRW CE35000AAA CE35000AAT CE35000AAW CE3500PPA CE3500PPW CE35100AAA CE35100AAT CE35100AAW CE3510PPA CE3510PPW CE3510PRA CE3510PRV CE3510PRW CE3520SPA CE3520SPW CE3520SRA CE3520SRW CE38000AAA CE38000AAT CE38000AAW CEA2C3 CEA2D2 CEA3D1 CEA3D1X CEA6D6W CEL1110AAH CEL1110AAL CEL1110AAT CEL1115AAH CER1100AAH CER1110AAH CER1110AAL CER1110AAT CER1140AAA CER1140AAQ CER1140AAW CER1140ACW CER1150AAH CER1150AAL CER1160AAH CER1160AAL CER1160AAT CER1350AAH CER1350AAL CER1360AGW CER1360BGW CER2350AAH CER2350AAL CER2350AGH CER2350AGL CER3520AAH CER3520AAL CER3520AAT CER3520AGW CES1110AAH CES1350AAH CEW2C3 CEW2D2 CEW3D1 CEW3D1X CEW6D6W CNEA100ACL CNEA100ACW CREA200ACL CREA200ACW CREA300ACL CREA300ACW CREA400ACL CREA400ACW CSR3602WW D-150 D-950 EBE22AA EBE22AA EBE22AA0 EBE22AA0 EBE22AA0 EBE22AA0CEH EBE22AA0CEH EBE22AA0CEH EBE22AA0CEH EBE22AA0CEH EBE22AA5 EBE22AA5 EBE22AA5 EBE24AA EBE24AA EBE24AA0 EBE24AA0CEH EBE24AA0CEH EBE24AA0CEH EBE24AA5 EBE24CB0 EBE24CB5 EBE26AA EBE26AA EBE26AA0 EBE26AA0CEH EBE26AA0CEH EBE26AA0CEH EBE26CB0 EBE26CB5 ED1-56A19 ED1-56A49 ED1-56W19 ED1-56W49 ED9-52A411R ED9-52W411R ED9-56A429 ED9-56A439 ED9-56W429 ED9-56W439 ED9-57A419R ED9-57W419R EG9-56A79 EG9-56W79 EG9-57A439 EG9-57W439 EG956A429 EG956W429 EHA112 EHA312 EHA312-OP EHA314 EHA315 EHA335 EHA353 EHA394 EHA395 EHB312 EHB340 EHB352 EHC312 EHC314 EHC335 EHC394 EHD112 EHD267 EHD312 EHD335 EHD341 EHD363 EHD379 EHD397 EHN3302W EHN3302W EHN3302W EHN3402W EHN3402W, L EHN3402W, L EHN3412L EHN3412W EHS2672L EHS2672L EHS2672W EHS2672W EHS2672W EHS305 EJA312 EJA314 EJA315 EJA335 EJA367 EJA394 EJA395 EJA397 EJC312 EJC314 EJC335 EJC394 EJS306 EKD9-51A439 EKD9-51W439 EKD9-52A439 EKD9-52W439 EPD9-56KA439A EPD9-56KW439A EPG9-76W539 ESD342 ESF31002L ESF31002L ESF31002L ESF31002W ESF31002W ESF31002W F-150 FCU128 FEU208 G3510PRA G3510PRW G3521WRA G3521WRA-3 G3521WRA-4 G3521WRV G3521WRV-3 G3521WRV-4 G3521WRW G3621XRA G3621XRA-3 G3621XRA-4 G3621XRW G3621XRW-3 G3621XRW-4 GA3510PRW GA3531WUA GA3531WUV GA3531WUW GBC26CK GBE22AA GBE22AA0CEM GBE22AA0CP GBE22AA0CP GBE22AA0CP GBE22AA0PT GBE22AA0PT GBE22AA0PT GBE22AA0PT GBE22AA5CEM GBE22AA5PT GBE22AAOCP GBE22AAOEPT GBE22GP GBE24AA GBE24AA GBE24AA0CT GBE24AA0CT GBE24AA0EPT GBE24AA0PT GBE24AAOCP GBE24AAOPT GBE24CB GBE24CC GBE24FC GBE26AA0CP GBE26AA0CP GBE26CB GBE26DB GBE56FB GC3531WUW GM3510PRW GM3531WUV GM3531WUW GM3631XUA GM3631XUW GN3531WUA GN3531WUW GV3531WUA GV3531WUW H1500PRW H3500PPA H3500PPW H3510PPA H3510PPW H3510PRA H3510PRW H3520SPA H3520SPW H3520SRA H3520SRW JE3510PRW JE3521WRV JE3521XRA JE3521XRW LEU108 MER1140AAW MER1350AAW MER2350AAW MER4110AAW MER4320AAA MER4320AAW MER4326AAA MER4326AAW N1500PRA N1500PRW N3510KRA N3510KRW N3510PPA N3510PPW N3510PRA N3510PRW N3520SPA N3520SPN N3520SPW N3520SRA N3520SRW N3521XPA N3521XPW N3521XRA N3521XRW NEA2G1 NEA2H0 NEA2H1 NEA3G1 NEA6G6CLW NER1360AGH NEW2G1 NEW2H0 NEW2H1 NEW3G1 NEW6G6CLW PD-950 PER4100BAW PER4102BAH PER4102BAT PER4305BAH PER4305BAT PER4510AAQ PER4510AAW PER4510ACW PER5508BAQ PER5508BAW PER5509AAW PER5510AAQ PER5510AAW PER5510ACW S1050EH-Z S1050EJ-Z S35HA-92X S35HA-92X-19 S35HK-92LX-ON S35HK-92X S35HN-92X S35HN-92X-19 S35HY-92X S38FA-2CX-94 S38FK-2CX-94 S38FK-2CX-OC S38FY-2CX-94 S65HA-1XS-AX S65HN-1XS-AX SBC24FX0 SBC24FX0 SBC24FX5 SBC24FXOW SBC26CK SBE22AA SBE22AA0 SBE22AA0 SBE22AA0 SBE22AAOCP SBE22AAX SBE22AX SBE22AX SBE22AX0 SBE22AX0 SBE22GP SBE24AA SBE24AAOCP SBE24AAOPT SBE24CB SBE24CC SBE24FC SBE26AA0 SBE26AA5 SBE26CB SBE26CB SBE26CB5 SBE26DB SBE56FB SBE56FXL SBE56FXW SNE26AA SNE26AA SNE26AA SNE26CB SNE26CB SNE26CB SNE26ZZ SNE26ZZ SNE26ZZ VER1360AGH YEL1110AAH. Our mission is to become the #1 source for all your appliance part needs. We will attempt to process your address change, cancellation and order change as quickly as possible. However, we cannot guarantee that we will be able to provide this service. Please review your order for accuracy before submitting it. The time frame depends on your location and is determined by the Post Office. Please review the entire listing carefully and make certain you are ordering the part you need. Please note that appliance manufacturers frequently update their parts without warning. While we strive to update our listing pictures as quickly as possible, an outdated picture is not grounds for return. You must obtain a return authorization to return the part within this time frame. Parts are not eligible for return for any reason if we are not notified within the 14 day time frame. This is to insure that we can file a claim with the carrier when applicable. All items must be in a brand new (without signs of installation) and resaleable condition. All parts are inspected for signs of installation upon our receipt of them. In no way shall General Appliance Parts be liable for any loss, damage, fire, explosion, injury, including any incidental or consequential damages, or death as a result of ordering and/or installing any parts from our website or from the results of any action taken due to reading information found on our website. The information is provided as a courtesy to our customers to enhance their understanding of their appliances, it is not to be taken for instructional purposes on how to repair their system. General Appliance Parts suggests having all parts, accessories and equipment installed by a qualified heating and air conditioning technician. If a customer attempts to install a part, accessory or equipment, he or she should have a thorough understanding of electricity, reading wiring diagrams and the work to be performed. In no way shall General Appliance Parts be liable for any loss, damage, injury, including any incidental or consequential damages, or death as a result of ordering and/or installing any parts from our website or from the results of any action due to reading information found on our website. The item "International Jenn-Air Caloric Range Cooktop Stove 8 Surface Burner Y04000035" is in sale since Monday, May 21, 2012. This item is in the category "Home & Garden\Major Appliances\Ranges & Cooking Appliances\Parts & Accessories". The seller is "generalapplianceparts" and is located in Louisville, Kentucky. This item can be shipped worldwide.